We’d love your help. 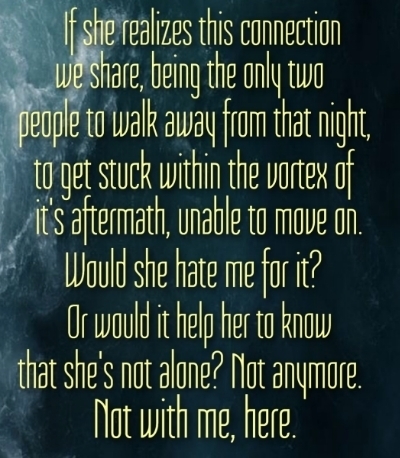 Let us know what’s wrong with this preview of In Her Wake by K.A. Tucker. When a drunken night out at a Michigan State college party results in the death of six people, Cole must come to terms with his part in the tragedy. Normally, he’d be able to lean on his best friends—the ones w Before you knew him as Trent in Ten Tiny Breaths, he was Cole Reynolds—and he had it all. Until one night when he makes a fatal, wrong decision…and loses everything. To ask other readers questions about In Her Wake, please sign up. Do I need to read this book before I start with Book 1? Karen Landolfi I recommend you to read it after the first book. What do you to when one decision changes everything in your life? Takes away not only your two best friends, but also the person you used to be? Not only that, but a carefree and happy teenage girl’s lost her parents, best friend, boyfriend and m 4 stars!!! What do you to when one decision changes everything in your life? Takes away not only your two best friends, but also the person you used to be? Not only that, but a carefree and happy teenage girl’s lost her parents, best friend, boyfriend and much of herself due to that choice. How do you come back from something like that? Is it possible to move on? To make amends? Cole Reynolds knows all about one choice changing his life. He knows about regret, loss and grief. I destroyed her life and then got caught in the wake. And I realize now that it’s exactly where I’m meant to be. Cole, Trent, whatever you want to call him… If you’ve read Ten Tiny Breaths, you know him and love him. I loved getting his back story. You find out the gist of what happened to him in TTB, but actually being in his head and learning the full story was great. The best part of this for me was seeing how much he truly did care about Kacey even before he knew her. If I didn’t already know and love him, it could seem borderline creepy, and it was a little extreme. But it was his way of coping and moving on. He’s a broken and depressed man who finds a way to claw himself out of it. It’s not a happy story, but for fans of TTB, it was great to see what lead up to Cole and Kacey meeting. Now I really want to jump into a re-read of TTB and re-live one of my favorites all over again! - This is a novella that focuses on the Trent before the events of Ten Tiny Breaths so even though this book chronologically comes first, I highly recommend reading TTB before this one. - If you are looking for a Trent 4 stars!! - If you are looking for a Trent and Kacey fix, I’m sorry to say you won’t be finding it here. You do not read about their relationship development, though you do see several scenes with Kacey in them. The novella is told entirely from his POV. Okay, moving on with the review. Out of all the books I’ve read from K.A. Tucker, Ten Tiny Breaths is my favorite. The devastating emotional impact, the imperfectly perfect characters, the heartfelt second chance romance are only some of the many reasons why I adore that book. I was secretly hoping there’d be a novella about Trent before he’s with Kacey but you know what they say right? Be careful what you wish for. Now that I’ve read about his past, frustration and sympathy have been warring in my head. I love that the author portrays his character with such harsh honesty, never flinching or trivializing his experiences and thoughts. But at the same time, this positive is also the downfall of the book for me. (view spoiler)[I really struggled to read about the old Trent. Grief and unresolved guilt can lead a person to extremes, causing them to act irrationally and that was precisely the case with Cole. No matter what the ordeal is, I will NEVER condone self-destructive behavior. I feel like Cole took the blame for his friends’ deaths and Kacey’s accident and didn’t even bother to try to pick up the pieces. It’s harsh but from the way I saw it, that’s what happened. He brushes aside his loyal and attentive girlfriend, his supporting parents, his old friends, basically everyone and the one person he focuses ALL his attention on is Kacey. When she doesn’t even know who he is. He follows her, just to make sure she’s safe. He tracks her online, just to learn more about her. He breaks into her email, just to find out her whereabouts. So why the 4 stars? As much as I disliked his actions in the book, I feel like I’m not in the position to judge if his behavior is right or not. I’ve never been in his shoes and didn’t experience the kind of grief he has so in a way, I’ll never fully relate and understand why he does what he does. The only thing I can judge is how well the author takes all that jagged pain and portrays his character in the story. As depressed, frustrated and melancholy I got, I have to say the author did a damn fine job. How the hell do you cross to get to the other side when you've run out of concrete? I guess you can slap on some wood to patch it up, to help you move on. But the bridge will never be quite right-- never as strong-- again. Note: I highly recommend you to read Ten Tiny Breaths first before diving into this novella to avoid spoilers. In Her Wake gave me a hard time to put my thoughts in order after reading it. It was so poignant and stirring, one that totally gives a serious emotional punch. In f How the hell do you cross to get to the other side when you've run out of concrete? I guess you can slap on some wood to patch it up, to help you move on. But the bridge will never be quite right-- never as strong-- again. In Her Wake gave me a hard time to put my thoughts in order after reading it. It was so poignant and stirring, one that totally gives a serious emotional punch. In fact, I like this novella way better than TTB because in here, the narration was retold in a more captivating and heart-wrenching way. K.A. Tucker sure knows how to make her readers shed a tear. Every line squeezed my heart. There were also lots of realizations that somehow affected me. The building of romance, more likely a one-sided attraction, also made me appreciate everything in this novella. It wasn't instant, but it was eventually established. What if she could learn to love again? And what if I'm the one who can remind her what that feels like? All in all, I admired how In Her Wake was delivered in a painful yet very sweet and promising appeal. Wow K.A. Tucker I loved this novella told completely in Cole’s pov of the events that landed our characters into position for book one. I strongly recommend book one to be read prior to this novella. 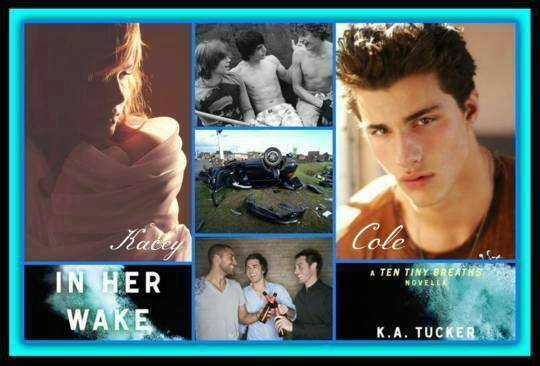 Cole’s loss, grief, guilt and utter despair is well written as was his need for Kacey to be okay. "Kacey's spiraling. Just like me." 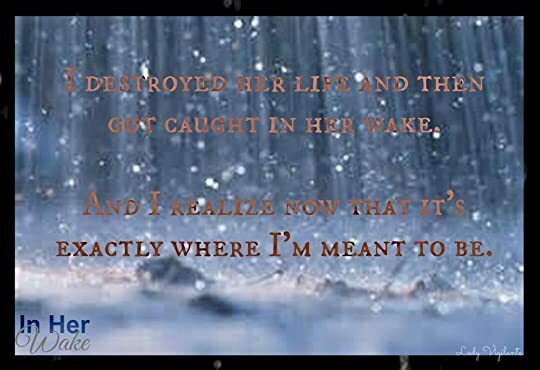 Cole falls to the pits of depression but his need to be connected to Kacey Cleary and make amends propels him to live. Overall, this is a short novella gifts a reader with the transformation of Cole becoming Trent. His inability to go back to the life he once led and his need to make the beautiful red head smile like the girl she was before the accident. First things first....Warning!! If you don't want to be spoiled, do not read this before Ten Tiny Breaths!! Even though it says its #0.5, it really should be #1.5. Ever since reading Ten Tiny Breaths, I've wondered how things came to be. Whatever happened to Trent and why he did what he did. Now...we get the answers. I knew this would be heart breaking but I had no idea the connection I would feel between Trent, Sasha and Derek. I think that's the part that was the most devastating, well, who am First things first....Warning!! If you don't want to be spoiled, do not read this before Ten Tiny Breaths!! Even though it says its #0.5, it really should be #1.5. I knew this would be heart breaking but I had no idea the connection I would feel between Trent, Sasha and Derek. I think that's the part that was the most devastating, well, who am I kidding? It was all pretty horrible. My heart went out to Trent and his poor parents. They took on sooo much of the burden. I hate what happened with them and what they had to go through but I loved how they were always there for Trent. And Trent...poor guy, to be soo tormented. I think KAT did too good of a job with that! One thing I didn't like reading was about Trent and a certain someone even though I did feel bad for her. Obviously, he had a life before but ugh. It was really interesting how Trent's "obsession" came about and some of the incidents he got himself into made me laugh! I can't believe he didn't get caught! I loved how it ended and it really made me want to read Ten Tiny Breaths all over again! ♥ "Did that smile survive?" 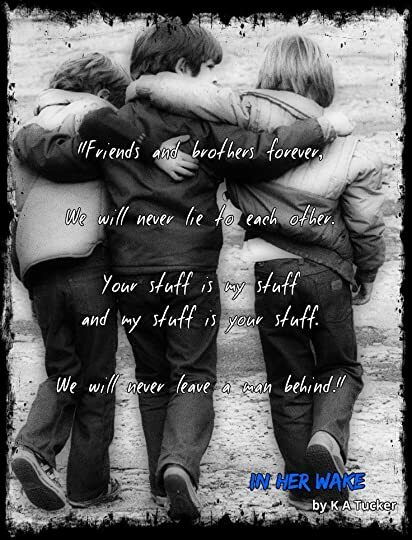 ♥ "Friends and brothers forever." I loved Ten Tiny Breaths so I was so excited to get to read Trent’s story. In Ten Tiny Breaths you mostly get to see the aftermath of the accident from Kacey’s point of view. You know that Trent obviously had a lot of regret and was devastated by the accident since he followed Kacey to Florida, and wanted to make things better for her. 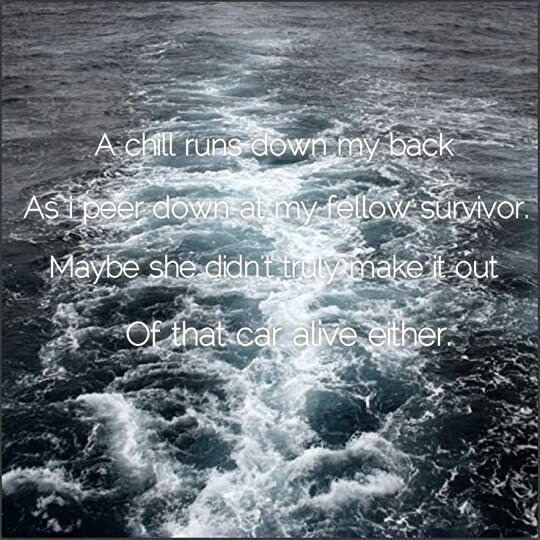 In Her Wake shows how Cole learns about the 16 year girl who was the only survivor in the other vehicle. He learns about how she had to sit in the car for hours with everyone else deceased waiting to get cut out of the vehicle. Cole develops a fascination with her, probably because they are both the only survivors in this horrific car accident. This novella gives us insight into Cole’s motives and what leads to him becoming Trent. I typically don’t think a novella is a 5 star read, so why did I give this one 5 stars? From the very beginning my heart was breaking for Cole. The guilt and responsibility he felt, I could feel his emotions when I read the story. Having lost someone I love in a car accident I could relate to the story and Trent’s journey of having to eventually move forward with his life. I think it is a 5 star read because in such a short story I was able to connect and feel for the characters. I loved that K.A. Tucker decided to write this novella! ARC kindly provided by NetGalley in exchange for an honest review. Great follow up to Ten Tiny Breaths. My heart was breaking reading about how Cole was feeling. This novella is short, but worth the read! I really liked Ten Tiny Breaths and I want to know more about Cole! I destroyed her life and then got caught in her wake. And I realize now that it’s exactly where I’m meant to be. Even though this is technically a prequel, it is imperative that you read Ten Tiny Breaths before reading this one. And having said that, this review is going to be hugely spoilery if you haven’t read TTB. This novella tells Trent’s side of the story – back when he was Cole. From the night of the accident, right through the four year period until Trent and Kacey a I destroyed her life and then got caught in her wake. This novella tells Trent’s side of the story – back when he was Cole. From the night of the accident, right through the four year period until Trent and Kacey are both in Miami, and he walks through that laundry door. KA Tucker does an amazing job at getting us right to the heart of all that Cole/Trent is feeling. We get to witness a brief glimpse at his life before it shattered to pieces, his realisation that all that has happened, and watch him try to deal with the aftermath, and it’s devastating. His life as he knew it is over as he loses everything dear to him, and the depression that he goes through is heartbreaking! Not only is he learning to live without the best friends that have been a part of his life for as long as he remembers, but he also mourns for Kacey and all that she has lost and he has to witness the follow on effect to his own family. And underpinning it all is the guilt that he feels over the whole situation. As tragic as it is, it really is one of those things that could happen to anybody, and it’s really painful to read. The crushing pain in my chest now has little to do with my injuries. Given all that he is going through, I thought that his actions towards Kacey are understandable. He focuses on her, wanting to help her through her grief, wanting her to be ok, and when he finds her spiralling out of control, he wants to protect her and help her find herself again. There is a touch of the creepy about it as his stalking gets a bit out of control, but his heart is in the right place and his dedication to helping her is a powerful force for him. I want her to meet me. Trent Emerson. The guy who wants to feel the warmth that I know exists within her. The guy who’s tied to her forever, whether she likes it or not. The one who needs to somehow make things right with her because I made everything so wrong. Trent’s story is beautifully written, and I loved getting this glimpse into his life before we meet him in TTB. I need to go and reread it now so that I can see him get his happy ending. This is a must read for all fans of the series. I loved it. 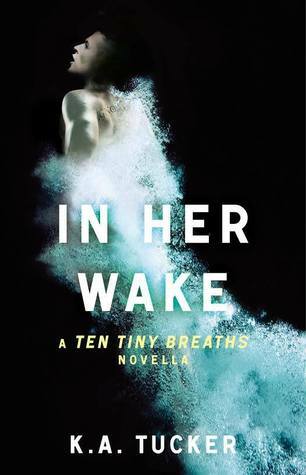 In Her Wake is a prequel to Ten Tiny Breaths. You do not have to read Ten Tiny Breaths prior to reading In Her Wake, however I strongly suggest you read Ten Tiny Breaths first, just so you can experience everything for the first time. This is Trent story, or as you known him as Cole in Ten Tiny Breaths. This tells his side of the story prior to meeting Kacey. I’ll be honest, this is a really sad read. Coming from Trent’s POV, you can really FEEL his pain. He holds a lot of guilt on that night. He does have a girlfriend and you feel bad for her too! They had the perfect relationship and she’s really sweet, but with the accident, Trent just went into the deep end. He stops caring and just basically gives up on life. He also is fixated on Kacey, which is cute, but also kind of sad because of his guilt. It’s difficult reading his struggles, but I liked getting his POV. If you are a big TTB fan, I recommend this short read. It’s very emotional and it gives you a better insight on Trent’s feelings. I LOVE this series and Ten Tiny Breaths was the first and still my overall favourite. Not an easy story to read but so gut wrenchingly beautiful. I was thrilled to learn that Ms. Tucker gave us this heartbreaking novella in Trent's POV. What a gift!! This novella takes place before TTB. It gave me a chance to fully understand where Trent was coming from and why he did what he did. It also beautifully sets up one of the best and most heartbreaking moments from TTB, IMHO, as he writes his letter in this novella. Perfection! The prequel for Ten tiny breaths told entirely from Coles POV. Gah I actually made it through this depressing book. If it wasn't so short I may have DNF. It wasn't a companion novel which I'm glad for but it was just too sad for my taste. There wasn't anything in particular I enjoyed. If you are a fan of the series or if you like to torture yourself with some heartache it may still work for you. Sadly not my type of book. In Her Wake is Trent/Cole’s story before he meets up with Kacey in Miami, and it’s a sad one. My heart definitely went out to Trent and you really don’t realize how much he suffered until reading this novella. 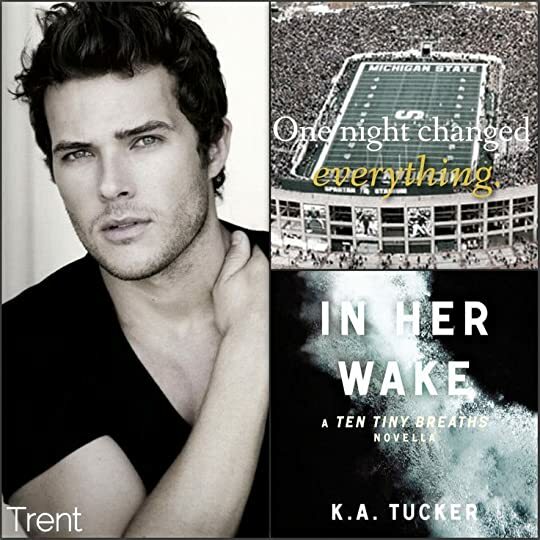 His story underscored what I felt in Ten Tiny Breathes, Trent and Kacey were meant to be. The accident marks a definite before and after for both Kacey and Trent. Life was so utterly changed after the accident and I doubt anyone could relate to just how tragic and profound those changes were except for Trent and Kacey. Trent suffers from major survivor’s guilt, because even though he wasn’t the driver of the vehicle that killed everyone, he was supposed to be the designated driver of the night and then was unable to fulfill his duties after drinking anyhow. Instead of calling a cab or waiting it out the house they’re at, his best friend, Sasha, says he’s fine to drive when in fact he’s drunker than Trent. I completely sympathize with his mistake because I probably would’ve trusted my friend’s word, too. If he said he was okay to drive I would’ve assumed that he wasn’t drinking and got in the car to drive home. Trent wakes up in the hospital and finds out the extent his error cost everyone. He’s lost his two best friends, four others are dead, and sixteen year-old Kacey is in the hospital suffering from major injuries. Trent struggles with resuming the life he had before the accident and instead basically checks out until he hits rock bottom landing him in the care of Dr. Stayner. The unconventional doctor we’ve met from previous books aids him to see that in order to move on, Trent needs to figure out how to forgive himself for being human. What amends will he have to make to do that? Even before this counseling Trent was fixated on Kacey, checking on her to see if she’s coping. When she’s clearly not dealing well, he makes it his mission to become a sort of guardian angel, looking out for Kacey’s well-being. Watching out for Kacey becomes more than just his way of making “amends”, though. He’s fallen for her from afar. I really had no idea the scope of Trent’s involvement in Kacey’s life in the years after the accident, and she had no idea of his presence at all. Lucky for her on a couple of occasions that he was looking out for her! Trent’s novella gives additional insight into Ten Tiny Breathes that I think fans will appreciate. I went back and re-read portions of TTB while reading this novella to refresh my mind and then after finishing In Her Wake to remind me of their HEA. K.A. Tucker added more depth and heart to an already beautiful story! A copy was provided by Atria Books in exchange for an honest review. Sono un po’ imbronciata sia con la Newton che con la Tucker. Si perché se mi avessero permesso di leggere questa novella prima dei volumi canonici sicuramente avrei valutato diversamente i primi due volumi della serie! Questa novella, a parer mio, non può essere letta all’ultimo perché è l’INIZIO di ogni cosa. Da qui si aprono le storie non solo di Cole e Kacey, ma a cascata, anche quella di Livie e di tutti i personaggi che entreranno in contatto con loro. La novella è splendida. È un pugno allo stomaco, un tuffo nel senso di colpa, nella perdita, nel dolore, nel rimpianto, nei se e nei ma. È il brillante esempio di come una vita possa cambiare in un attimo. Cosa rimane a Cole dopo l’incidente? Solo due cose: il dolore e il senso di colpa. Una colpa che è un buco nero, che lo perseguita, che non lo fa esistere, che lo costringe a rintracciare Kacey e a comportarsi come una specie di stolker, solo perché sente di dover espiare il suo peccato. Immediately after finishing 'Ten Tiny Breaths' I dived into this prequel. This was a short, quick novella that only took a few hours to listen to in it's entirety. Told in Trent's POV, this story takes us back in time to the night of the accident. The novella comes to an end when Trent relocates to Miami, at the beginning of 'Ten Tiny Breaths'. You will want to read 'Ten Tiny Breaths' before reading this prequel...or reading more of this review. Watching the foretold tragic events unfold through Immediately after finishing 'Ten Tiny Breaths' I dived into this prequel. This was a short, quick novella that only took a few hours to listen to in it's entirety. Told in Trent's POV, this story takes us back in time to the night of the accident. The novella comes to an end when Trent relocates to Miami, at the beginning of 'Ten Tiny Breaths'. You will want to read 'Ten Tiny Breaths' before reading this prequel...or reading more of this review. Watching the foretold tragic events unfold through Trent's eyes was heartbreaking. The guilt and self-loathing that he carried on his shoulders was tremendous. Seeing it from his perspective, I couldn't help but pity him and his parents. To then feel responsible for the destruction of his parents' marriage, in addition to the lives lost in the wreck and Kacey's downward spiral, was a unbearable cross to carry. Though, I have to admit that this book made me reevaluate my views on many things, including some pretty creepy stalking behaviors and incredibly invasive actions by Trent. This is one of those stories where you want to intervene somehow to prevent the inevitable from happening. Instead, you're left to observe from the sidelines, biting your nails down to the quick. It'll have your rapt attention, start to finish. Be prepared to shed some tears. Unlike the first book, this one does focus pretty much entirely on the emotional, depressing elements of Trent and Kacey's shared past. Me encanto !!! Me gusto mucho poder leer lo que le paso a Trent ♥ Sin lugar de esas precuelas que te agregan cosas a la historia! Oh Trent, you've destroyed my heart. Having read Ten Tiny Breaths last year, I was excited to read this novella from Trent's point of view. One night, one decision, six people dead and his life forever changed. In the aftermath of a horrific accident, Trent is struggling under the crushing weight of grief and guilt. Despite the efforts of family and friends who want him to somehow 'move on', Trent feels he doesn't deserve it. The only thing giving him a sense of purpose? His desire to ensure that Kacey Cleary, the only other survivor of the accident, is made whole again. In Her Wake was a emotional read and K.A. Tucker did a fantastic job of conveying Trent's feelings of grief and despair. He was in a position that no one should ever be in: weighted down by grief, suffering the loss of his friends, but also dealing with the larger-than-life guilt over his role in the tragedy. It made my heart hurt to watch as Trent went from outgoing all-American college student/football player with a bright future to a shell of who he used to be. And the ripple effect... the impact was felt by so many people in so many ways. Trent's girlfriend, his parents, Kacey and Livie. So many lives changed by the events of one night. Getting Trent's POV and a better understanding of his actions and motivation makes me want to go back and read Ten Tiny Breaths again. It brought so much more to the story. I liked the scenes he had with Kacey that weren't known/mentioned in TTB. He tried so hard to keep her safe, to make things right. One of my favorite things was the authenticity of Tucker's writing. Getting a male POV right (from a female author) can be tricky but Trent's voice here was so spot on. It was completely believable and I never doubted that I was reading from a 20-something male perspective. It made the whole reading experience so much better to have that believability factor. There's something about K A Tucker's writing that reels me in. She has this way of connecting with the reader and making them feel every emotion. Ten Tiny Breaths is one of my all time favorite books, so to read what happened before the fairy tale from Trent's POV was a great in site and makes me want to read the story all over again. Lo ripeterò all'infinito: La Tucker ha un modo di scrivere che ti cattura dalla prima parola. Ho divorato questo breve libro su Trent e,come era prevedibile, l'ho amato. Mi ha aiutato a capire meglio le sue motivazioni e le sue azioni, nonostante a volte sembrassero -e fossero- davvero assurde e al limite. E così sono arrivata ad amare Trent ancora di più. Complimenti, K.A. adesso ho una dipendenza! Although the Ten Tiny Breaths series is over, it was nice reading a novella that brought us back to the characters from a point of view we haven’t seen before. I would recommend reading this book only after you’ve read the first Ten Tiny Breaths book, as it contains some major spoilers. 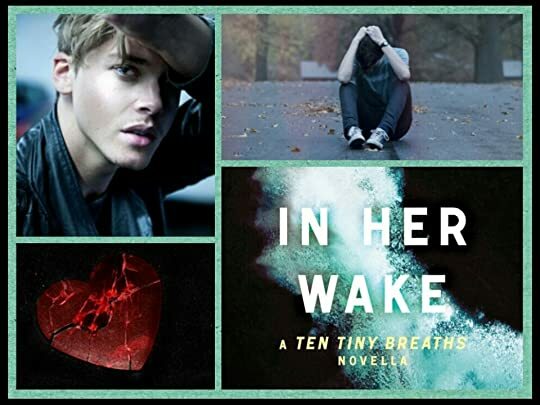 In Her Wake tells us Trent’s past before he met Kacey, tying it all together and showing us the depth of his trauma and emotion following the car accident that changed everything. Not only do we see what he was li Although the Ten Tiny Breaths series is over, it was nice reading a novella that brought us back to the characters from a point of view we haven’t seen before. I would recommend reading this book only after you’ve read the first Ten Tiny Breaths book, as it contains some major spoilers. 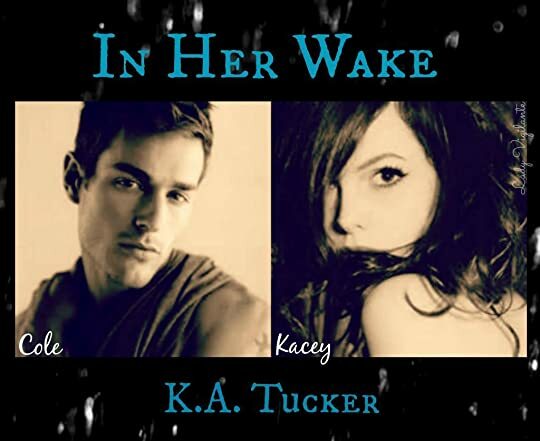 In Her Wake tells us Trent’s past before he met Kacey, tying it all together and showing us the depth of his trauma and emotion following the car accident that changed everything. Not only do we see what he was like before the accident, we also witness his family and friends before his life changes. It’s a really confronting book, as Trent spirals into deep depression and his whole demeanor changes – just like it did for Kacey. We see how much the accident tore both of them apart, and how they learnt to cope in different ways. Kacey, on a reckless disregard for her own life and Trent, on his unwillingness to accept what has happened and scarily, his stalking of Kacey. I didn’t expect to see this side of Trent, with his guilt over the accident leading him to obsess over Kacey’s wellbeing. He does some pretty creepy things, but we know the reason behind it is because it’s his way of coping after the accident, and somehow knowing how it all turns out kind of made it seem less creepy. For it’s short length, a lot happens in this novella as it covers two years from when the accident happened to the characters as we know today. I was super excited for this novella because I wanted to know how Trent felt when he was talking to Kacey. I wanted to know his thoughts in many scenes that was in Ten Tiny Breaths. But this book was not what I thought it was.It was the story of Trent before he meets Kacey. Ma si Cole/Trent prendi pure il mio cuore e fai un bel sushi cardiaco! Ero pienamente consapevole che il tuo pov mi avrebbe fatto a tocchetti, ma non ho saputo resistere... Adesso devo almeno sbirciare le pagine del primo libro, per rinfrescarmi la mente sulla tua gnoccaggine assolta! I can't believe I hadn't read this yet. It was really interesting to get Trent's POV. Now I want to reread Ten Tiny Breaths - it's been so long! K.A. Tucker completely embodies the heartbreaking feelings of loss in this story. There is absolutely nothing in life that prepares an individual for the untimely death of a young friend... all of those reminders that keep that loss fresh in one's mind, the all consuming grief following a tragedy... she delivers it so profoundly. I read this book with an incessant ache in my chest. Ten Tiny Breaths was Kacey's story, so in that story I mourned her loss, her parents, her friends, her previous lif K.A. Tucker completely embodies the heartbreaking feelings of loss in this story. There is absolutely nothing in life that prepares an individual for the untimely death of a young friend... all of those reminders that keep that loss fresh in one's mind, the all consuming grief following a tragedy... she delivers it so profoundly. I read this book with an incessant ache in my chest. Ten Tiny Breaths was Kacey's story, so in that story I mourned her loss, her parents, her friends, her previous life. In Her Wake completely immersed me in Trent's loss, and I mourned the passing of the friends I'd had no connection with before. Trent's first few days after the accident are painful to see firsthand. K.A. Tucker writes these scenes in such a brutally honest way, the guilt, the loss, the heartbreak, the grim outlook on life he has after the loss of his friends, that my heart felt that loss and pain so much more vividly than I had while reading Ten Tiny Breaths. It's delivered here in this novella in a way that couldn't quite be captured in another character's point of view, as it was in the first book. That book was gutwrenching, yes, but in a different way. Trent's pain can really only be conveyed adequately through Trent's own words. We know from Ten Tiny Breaths, Trent had sought out Kacey, the only other survivor in the tragic accident that killed six people. This novella gives so much more insight into the depths of Trent's curiosity about Kacey. How far back it really went, how far Trent went at times to hear her voice, check up on her, keep tabs on her. If it were anyone else, in any other situation, it would border on stalking. With any other two people, it would have crossed the line of inappropriate, unhealthy behavior by miles. Ok, maybe it did cross that line. But it's Trent and Kacey. A guy who blames himself wholly for the accident that killed this girl's parents, her best friend and her boyfriend. Both are struggling with pain so deep no one else but the other could possibly understand that pain, that loss, that guilt of being the sole survivor in their respective cars. Both are spiraling, yet Trent feels compelled to make sure Kacey is okay. And so this seemingly inappropriate dynamic is understood. 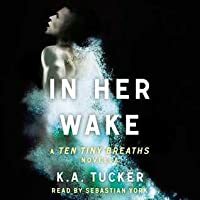 K.A Tucker's "Ten Tiny Breaths" was one hell of an amazing read and Trent... well it was difficult not to fall head over heels in love with him. Unfortunately, his story was a tragic one and as much as I'd worked out his connection to Kasey Cleary very early on, it didn't make what unfolded any less heart breaking. To say I was a little excited when the author announced we'd be getting a prequel to TTB is an understatement. 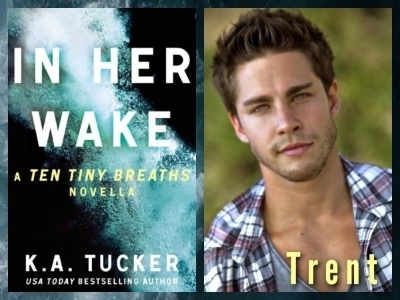 I was desperate for more Trent but I had a feeling "In her Wake" wouldn't be an easy read and I was right. From the first page to the last, I felt an ache in my chest that just wouldn't go away and the further I progressed into Trent's book, the more the tears threatened to spill and the more I just wanted to make everything better for him. Want a story that's full to the brim with raw emotion, than look no further, this is definitely it. One night... one bad decision is all it took to change the lives of so many people. Relationships were torn apart, dreams were lost into the abyss of depression and futures became more of a nightmare than something to look forward to. It was difficult not to be affected by Trent's story and although I should have maybe felt some anger towards him, I just couldn't because I could see that he was living in his own personal hell. K.A Tucker made it so that I felt his pain, guilt and the weight of blame that he carried on his shoulders and I wouldn't wish that on anyone. "In her Wake" told of the lengths one man would go to try and right a wrong. Did Trent go about it in the correct manner? If you haven't read TTB, you'd probably think he was one crazy weirdo. For those of you who read the book, you'll know how it all unravels. For me, this book really did tie up the "Ten Tiny Breaths Series" perfectly. I loved getting the opportunity to rummage around in Trent's head even if it did leave me feeling devastated. If you haven't read the series, I can't recommend it enough and this book gets another 5 Hearts from me. Go click... you really don't want to miss out!!! A copy of this audiobook was provided by the publisher in exchange for an honest review. My thoughts are my own. I am really going to miss this series. I've listened to every single book on audio, and these narrators have really become favorites for this genre. This is one of my favorite new adult series, too. So, when I had the opportunity to review the audio for Trent's story, the final -- or first, depending on how you look at it -- chapte A copy of this audiobook was provided by the publisher in exchange for an honest review. My thoughts are my own. I am really going to miss this series. I've listened to every single book on audio, and these narrators have really become favorites for this genre. This is one of my favorite new adult series, too. 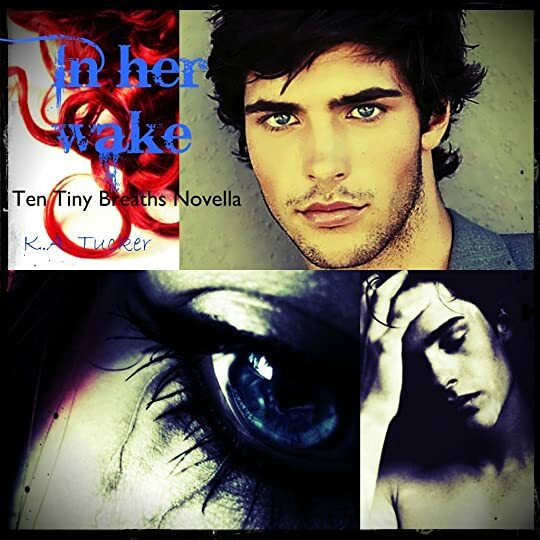 So, when I had the opportunity to review the audio for Trent's story, the final -- or first, depending on how you look at it -- chapter in the Ten Tiny Breaths series, I had to jump on it. Sebastian York is a fabulous narrator. I've only heard a few of his performances, but he has such a masculine presence, one that you won't easily forget. His voice is so deep and so seductive that it's hard to believe that he's not speaking directly to you, just for you. Bringing him back to portray Trent in this novella was the best idea. He just brings such a depth to Trent's character, a forlornness that I don't think was exactly visible the first time we met his character in Ten Tiny Breaths. Honestly, if I didn't know the story already, I might have immediately written Cole's character off for his stalker tendencies and inability to move on, to put distance between himself and those he hurt. But I do know the situation and how things turned out -- and the fact that he owns up to a lot of what he does in this novella -- so I can forgive him. Also, seeking aide from Dr. Stainer goes along way for his character. I've missed seeing that guy in the last couple of books. I don't know if I could pick a favorite book in this series. It's solid through and through, and the narration just made each book that much better. I'm going to miss these characters and all of their drama and also their happily ever afters. But I just might miss Trent most of all. She is the USA Today bestselling author of 17 books, including the Causal Enchantment, Ten Tiny Breaths and Burying Water series, He Will Be My Ruin, Until It Fades, Keep Her Safe, and The Simple Wild. Her books have been featured in national publications including USA Today, Globe & Mail, Suspense Magazine, First for Women, and Publisher's K.A. Tucker writes captivating stories with an edge. Her books have been featured in national publications including USA Today, Globe & Mail, Suspense Magazine, First for Women, and Publisher's Weekly. She has been nominated for the Goodreads Choice Award for Best Romance 2013 for TEN TINY BREATHS and Best Romance 2018 for THE SIMPLE WILD. Her novels have been translated into 16 languages. 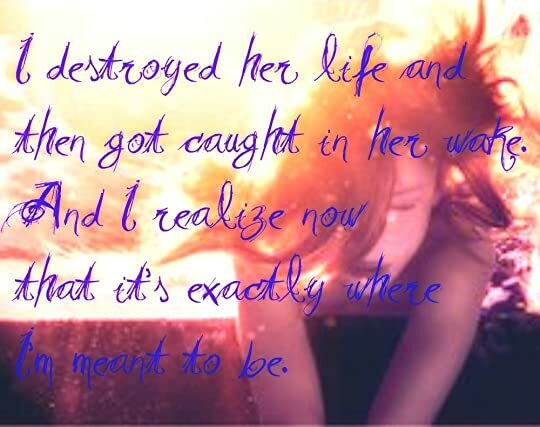 “I destroyed her life and then got caught in her wake.